Old Town Square (“Staroměstské náměstí” or familiarly “Staromák” in Czech), the oldest and historically most significant square in Prague, is according to many people one of the most beautiful European squares. Not only was it the venue of numerous dramatic historical events, but it is incredibly beautiful and charming. The Old Town Square is nowadays still Prague’s beating heart. Located between Wenceslas Square and Charles Bridge and covering an area of over 9 thousand square metres, the Old Town Square is bordered by many interesting historical buildings and is definitely one of the top “must-see” places to visit when you travel to the Czech Republic. When you go there, reserve a lot of time, because there is so much to see and do at the square. The Old Town Square is a remarkable venue where the history of Bohemian lands has often been written. In the 11th century, there was a market place, which grew gradually in significance until it became the most important in the country. The square used to be called “Big Square” (“Velké náměstí” in Czech) or “Old Marketplace” (“Staré tržiště”). As we already mentioned, the Old Town Square has been the setting for many significant historical events. Let us mention some of the most important ones. In 1422 an uprising took place after Jan Želivský, a significant figure of the Hussite Reformation, was executed. In 1621, one of the most tragic events of the Czech uprising of the estates (the historical period of 1618-1620, during which the social class of estates fought against the Hapsburg reign) happened at the Old Town Square. As many as 27 leaders of the uprising were collectively executed, marking the tragic end of the liberation efforts. This mass execution of 27 Czech noblemen is also known as “the Old Town Square Execution” (“Staroměstská exekuce” in Czech). In 1902, people were demonstrating for the implementation of universal suffrage at the Square, and yet another important event took place in 1918, when the folk demanded a declaration of independence from Austria-Hungary. After Vienna became the capital of the Austrian lands instead of Prague, the Old Town Square lost some of its significance, but after the beginning of an Independent Czechoslovak State in 1918, the square’s importance began to grow again. 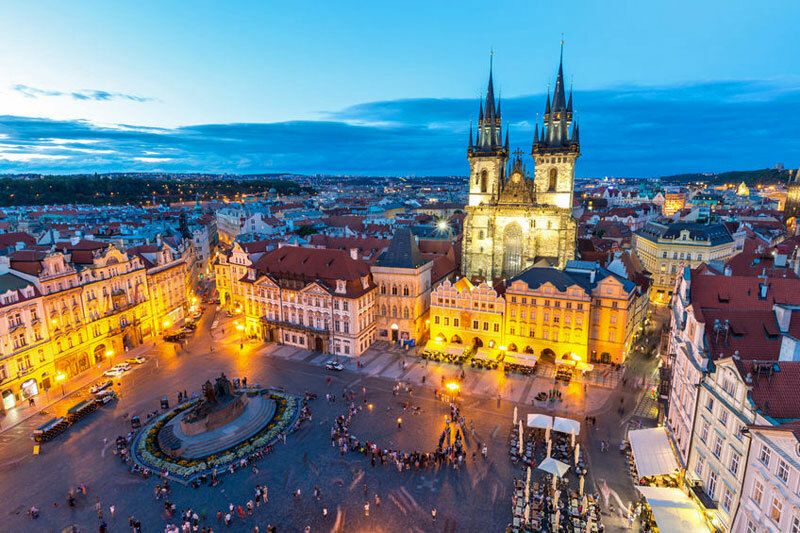 Nowadays, The Old Town Square is, among other things, the historical centre of the Old Town of Prague and one of the most visited places in the Czech Republic. Also, the Square is a venue for numerous occasional and regular events, such as Christmas fairs (when there is always an enormous Christmas tree installed) or exceptional public broadcasts of significant sports matches. Prague’s Old Town Astronomical Clock, the world-famous technical miracle from the 15th century, definitely belongs among the biggest “must-see” attractions not only in Prague, but perhaps the whole of Europe. Every year for over six centuries, hundreds of thousands of tourists from all over the world visit the Clock and patiently wait in the Old Town Square for its show to start. 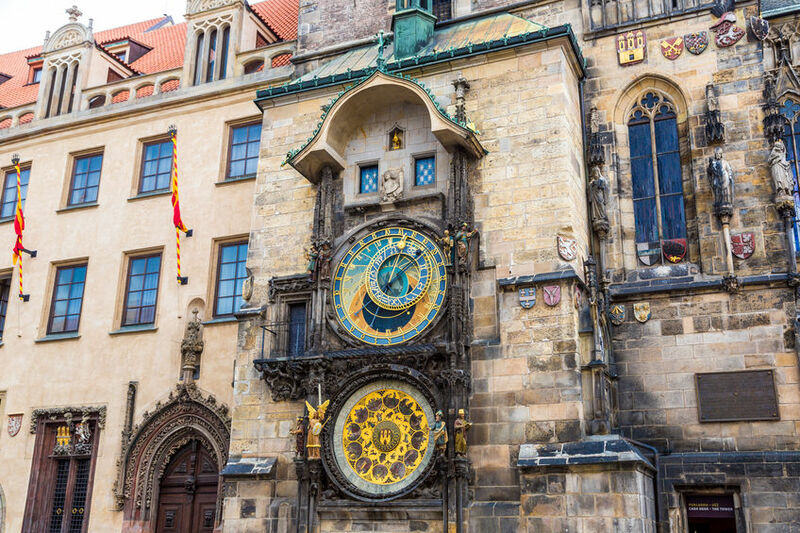 For more information read our full article about the Astronomical Clock. The Old Town Hall (“Staroměstská radnice” in Czech) belongs among the most noteworthy monuments of Prague, not least because of its above mentioned Astronomical Clock. The hall was founded as the first of its kind in the country in 1338, based on a privilege vested by John the Blind, the Count of Luxembourg and King of Bohemia (known as “Jan Lucemburský” in Czech), to the townsmen. The oldest part of the complex, built in the Gothic style, consists of a beautiful tower with the Astronomical Clock. The Eastern Neo-Gothic wing of the Old Town Hall was destroyed during the Prague uprising in 1945. Visitors can see historical halls, the tower, and the underground premises. The Old Town Hall is also a very popular venue for weddings. The Gothic Church of Our Lady before Týn (“Kostel Matky Boží před Týnem” or “Týnský chrám” in Czech) is one of Prague’s dominant viewpoints. It took almost two hundred years (from the 14th to the 16th century) to be built. The Church amazes with its beautiful, 80-metre high towers and a rich baroque interior. Nowadays, the cathedral serves as a gallery. The Baroque St. Nicholas Church (“Kostel svatého Mikuláše”) was built between 1732 and 1737, in place of a Gothic church which burnt down. The remains of the former church can be found in the basement. The St. Nicholas Church attracts with its main marble altar, beautiful sculptural decoration of the access front, and the stucco decor created by Bernardo Spinetti. Kinský Palace (“Palác Kinských” or “Palác Golz-Kinských” in Czech) is a significant historical Rococo building on the eastern side of the Old Town Square. It was built in the 18th century and nowadays still amazes with its rich interior decoration and two monumental gates with pillars. The National Gallery placed some of its valuable collectibles in the Palace´s premises. Right next to the Kinský Palace, one can find the House at the stone bell (“Dům u kamenného zvonu”). The House is nowadays just a residue of the original building from the 14th century. The Prague Gallery organizes various cultural events in the originally Gothic building, later reconstructed in the Baroque style – with the façade quite recently renewed in the original Gothic style. Yet another precious historical sight of Prague can be found close to the Old Town Square. The history of Ungelt (or “Týn Courtyard” – “Týnský dvůr” in Czech) reaches back to the 12th century. Even though each house in the complex represents a different architectural style, the resulting general appearance is harmonic and also absolutely unique. In the centre of the Old Town Square, the Jan Hus Memorial dominates, reminding all Prague residents and visitors of one of the most significant and world-renowned Czech historical figures. The memorial represents Jan Hus, a religious reformer, who was burned for his unshakable beliefs at the stake in Constance in 1415. 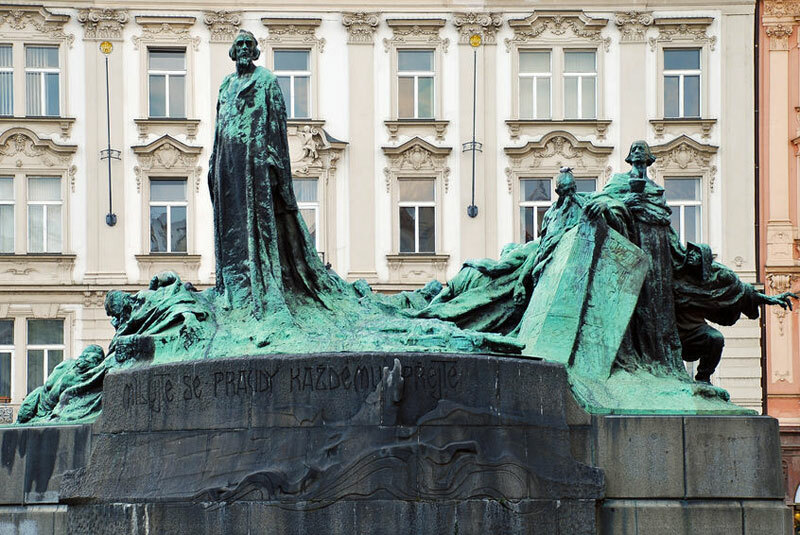 The secession bronze memorial was dedicated in 1915, on the 500 year anniversary of Master Jan Hus’ martyrdom. The statue was created by a prominent Czech sculptor called Ladislav Šaloun and is protected as a national cultural heritage. Jan Hus is displayed in the middle of other figures, proudly looking towards the Church of Our Lady before Týn, which used to be the centre of the Calixtins in his era. 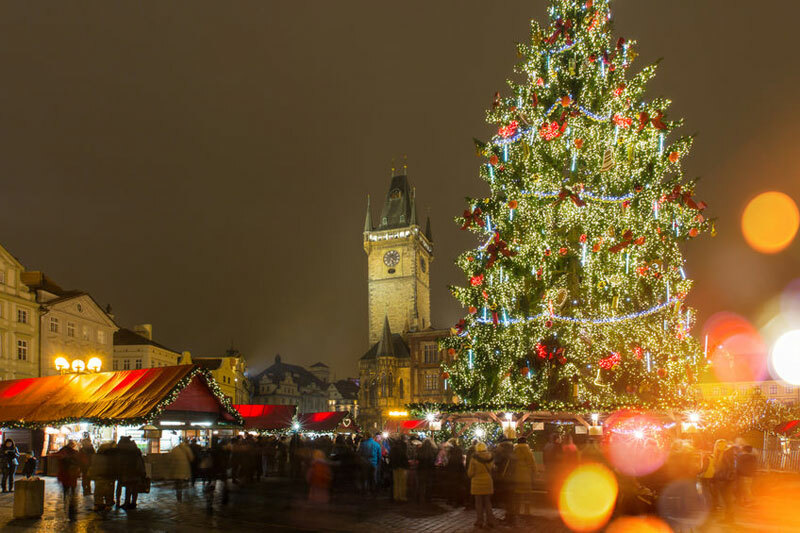 The Old Town Square is located right in the centre of the Old Town of Prague, halfway between the Vltava river and “Náměstí republiky” square. Many well-known streets full of sights, shops, and restaurants lead to the Square, for example “Kaprova”, “Celetná”, “Dlouhá” and “Pařížská”. One can easily walk to the Old Town Square from the “Staroměstská” metro station. The square is open to the public every day, 24 hours, with no restrictions. Also there is no entrance fee and you don’t need any tickets. Just come and see the beauty.